Click on any of the four thumbnail images above for a larger view. 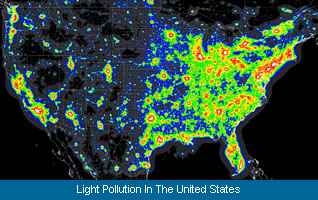 As you can easily see from the overall map of the United States above, light pollution is a major problem, particularly in the eastern half of the nation. 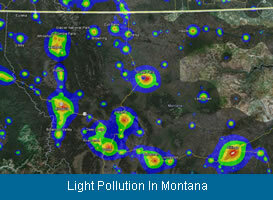 The lower two images show close-up views of the Pacific Northwest on the left and Montana on the right. 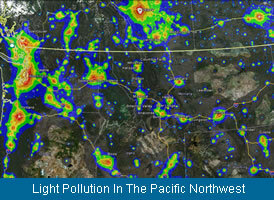 Because of its lower population density, light pollution in the western United States is less severe than that of the eastern portion. 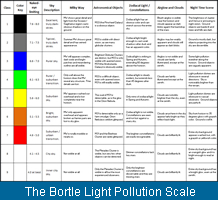 It is obvious, though, that the urban areas of the west are no less susceptable to the detrimental effects of light pollution than our eastern neighbors. It is estimated that, of the $5,000,000,000 in annual energy costs that are wasted world-wide, the United States alone contiributes two billion dollars of that total.